In the time before penicillin or sulfa drugs, people used natural substances such as honey or plant oils to combat bacterial infections. I've written about a couple of these already, but it turns out I missed an important one. It's important because it represents one of the earliest efforts to turn the antibacterial weapons possessed by microbes against themselves, an approach that has yielded most of the antibacterial drugs we depend on today. Way back in the 1890s, researchers discovered they could protect rabbits against anthrax (caused by the bacterium Bacillus anthracis) by injecting them with a solution containing another disease-causing bacterium known as Bacillus pyocyaneus (now called Pseudomonas aeruginosa). B. pyocyaneus, named for its blue colour (kýanos = ancient Greek for dark blue), is a common inhabitant of soil and fresh water. It can also infect people, making its presence known by staining flesh and pus a turquoise colour. 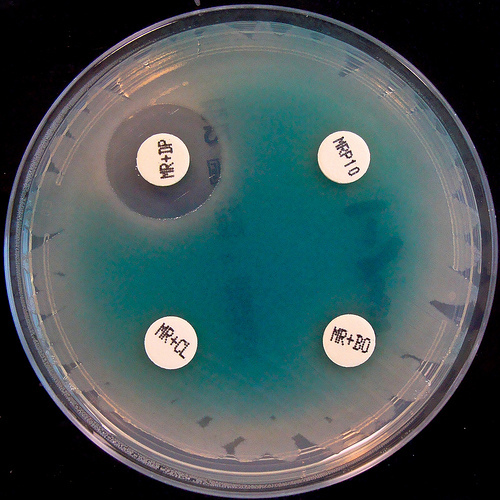 In order to deal with its competitors, B. pyocyaneus produces several compounds capable of harming bacteria. One of these is pyocyanin, a blue-green pigment that helps the bacterium take up residence in the lungs of people with cystic fibrosis. By extracting a mixture of compounds from old cultures of B. pyocyaneus, two German dudes named Emmerich and Löw obtained an antibacterial substance they dubbed pyocyanase. This extract was shown to be capable of killing the bacteria responsible for several important human diseases (e.g. typhoid fever, diptheria, and plague). Unfortunately, pyocyanase ended up being way too toxic to use systemically. In other words, it couldn't be introduced into the bloodstream by swallowing it or injecting it into a vein in order to treat infections anywhere in the body. Nevertheless, it did see use in parts of Europe in the early 20th century for the localized treatment of infected tissues (e.g. being injected into abscesses, applied to infected eyes, or sprayed onto sore throats). While it proved to be a somewhat useful drug (it was sold in Germany into the 1930s and a derivative called neopyocyanase was used to treat Hitler's throat infections during WWII), pyocyanase was rendered obsolete by penicillin.